So if you’ve been around LVN for a while now you may have noticed that I have a growing obsession with drop cloth curtains. It’s kind of out of control. I first put them in our basement and I now have two sets in our front room, dining room, and my daughter’s room. I absolutely love them and I wish I could put them on every window in our home. Not only are they crazy affordable, but they look great in any room and they’re super simple to do. 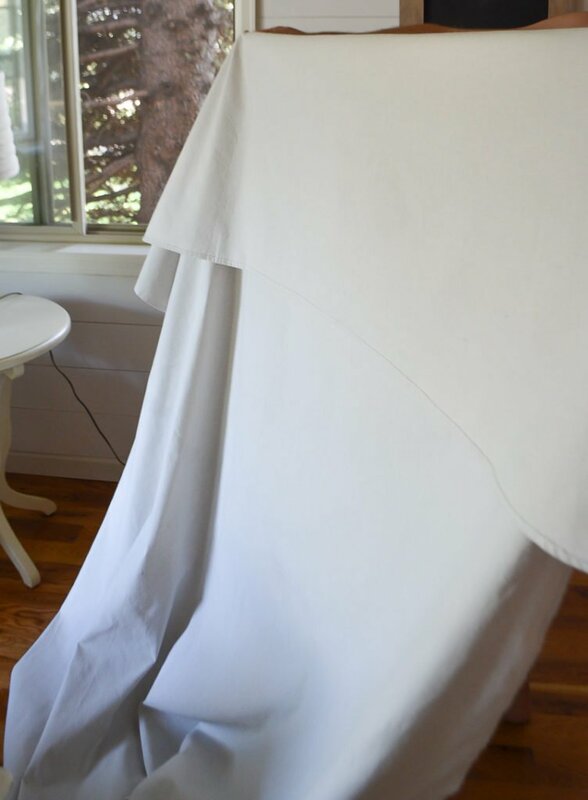 I wrote a full review of these already, but today I’m sharing a step by step drop cloth curtain tutorial that shows you exactly how to do these in your own home. Now if you aren’t already familiar with DIY drop cloth curtains let me just say how insanely easy they are. I mean, there is no sewing, no cutting, no measuring. Nothing. This is literally a two-step process that anyone can do. Plus they are completely customizable to work with just about any window. 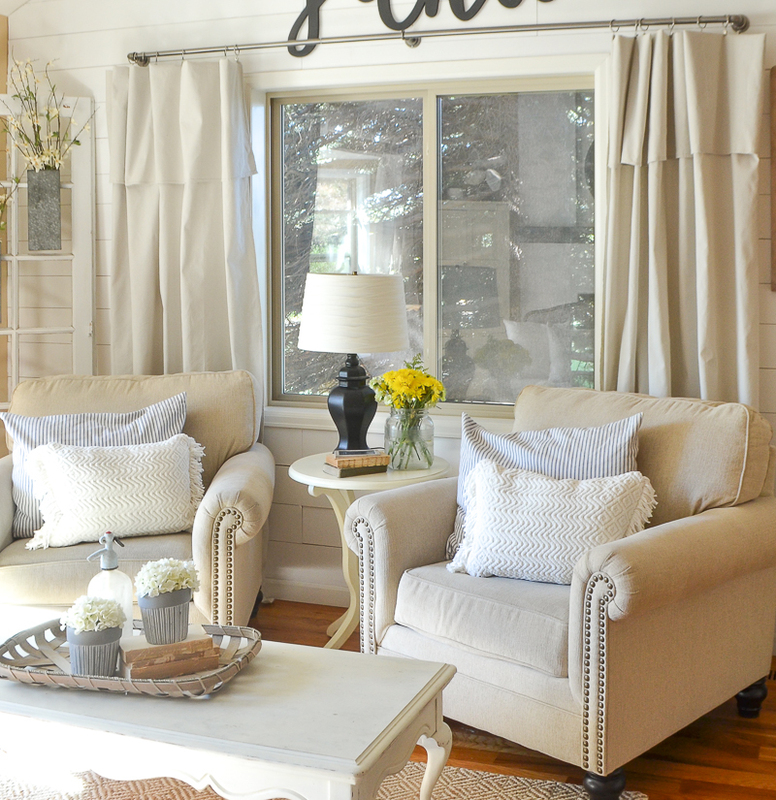 I’m so excited to show you guys the awesomeness of drop cloth curtains today, so let’s hop right into it! 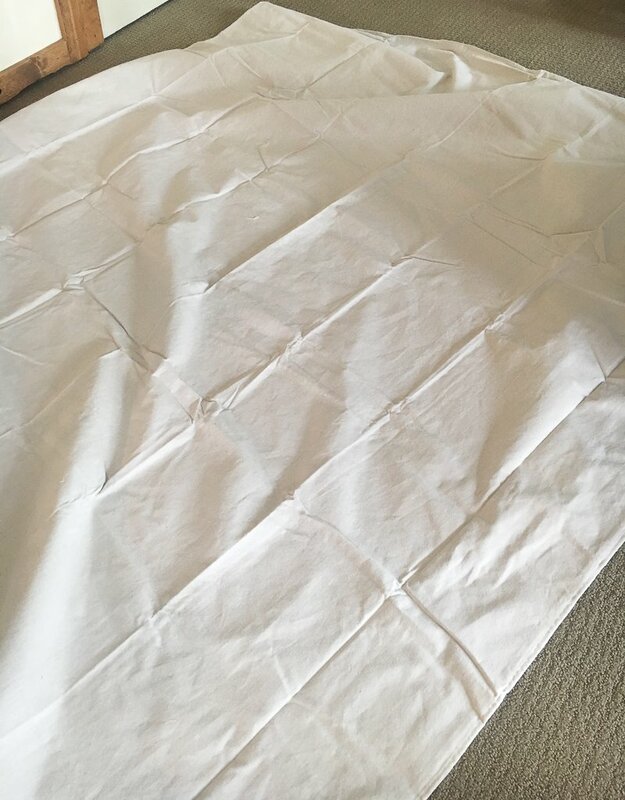 canvas drop cloths–I get mine from Home Depot, you can see the exact ones I use here, and they measure about 6×9 feet. Step 1: Get the wrinkles out! The first and hardest step in this entire process is getting the stubborn wrinkles out of the drop cloths. You’ll notice when you take them out of the package that they look like a hot mess. Creases and wrinkles everrrryyywhere. I always start by throwing mine in the washing machine for a quick cycle, followed by a spin in the dryer. When they come out they’ll still be wrinkled, but the giant creases are gone. Next I grab my iron, turn on a good movie, and get to work smoothing these babies out. 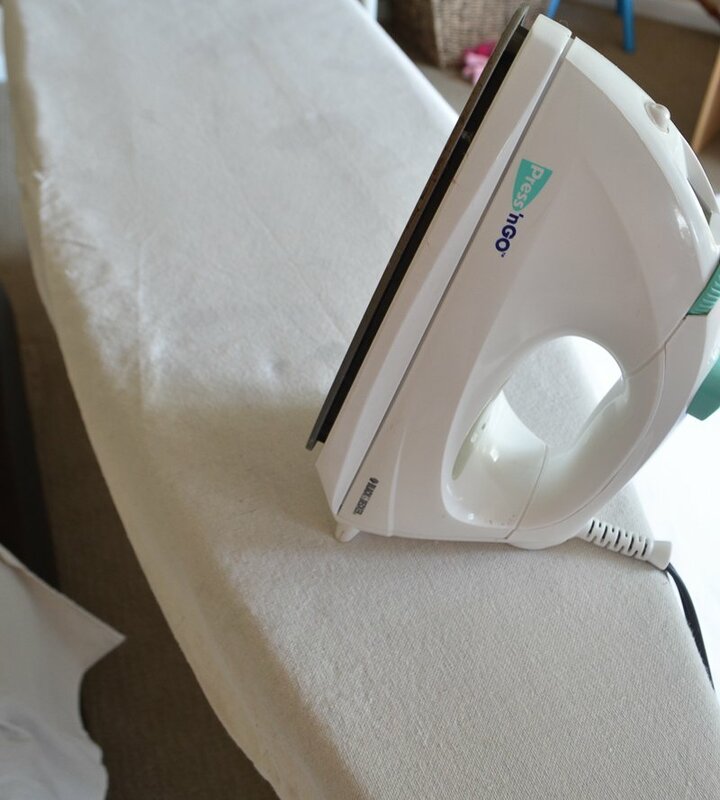 This is by far the worst part of the entire process, especially if you hate ironing like I do. You could always skip this step if you don’t mind the wrinkled look, but that’s totally your call. Step 2: Hang them up! 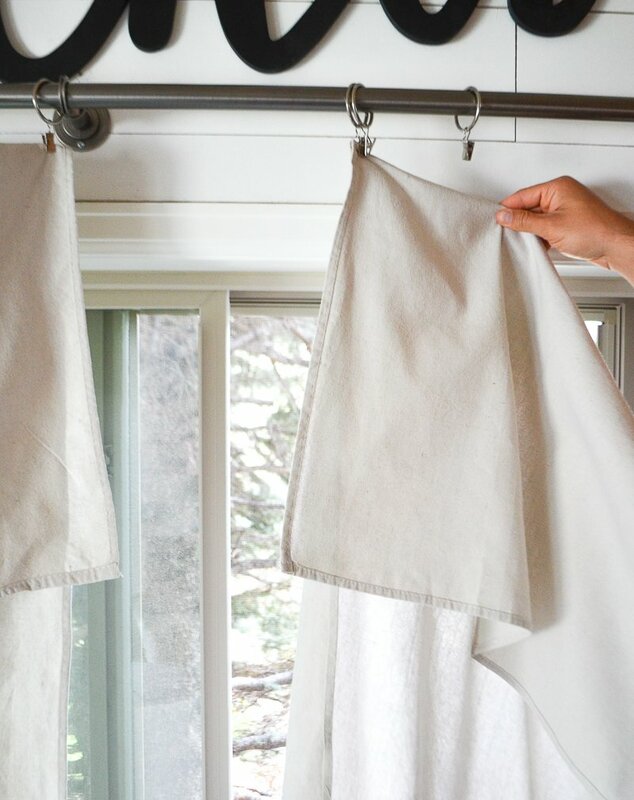 Once you have the drop cloths smooth and wrinkle free, you are ready to hang them up! 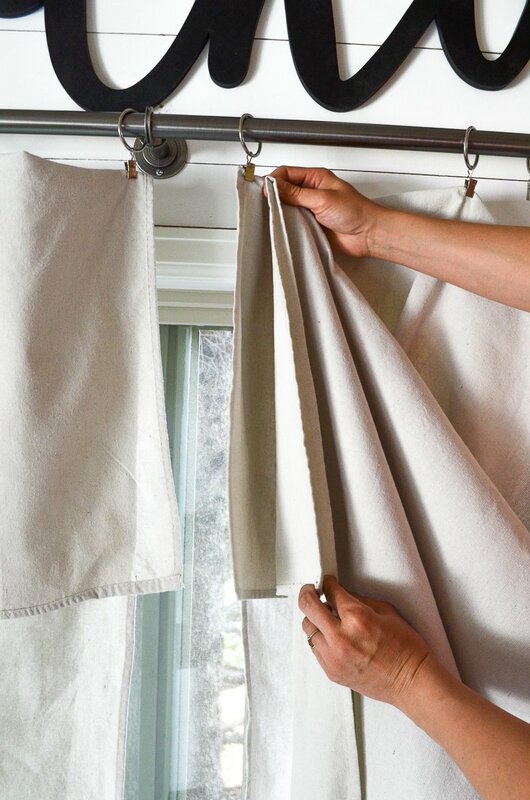 This is when you’ll want to grab those drapery clips–go ahead and put them on your curtain rod so they’re all ready to go. 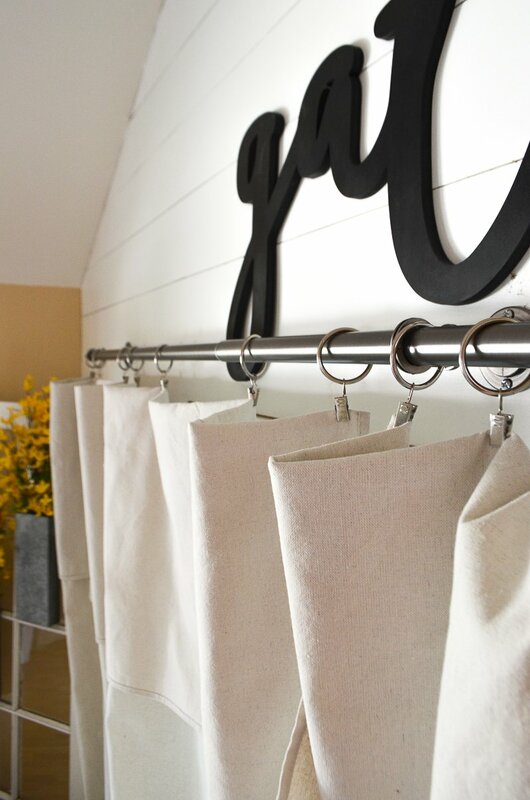 Now there are two ways you can hang the drop cloths: 1) with the top folded over 2) hanging straight. Both look great, so this is totally up to you. I prefer to do the fold over top because it allows me to customize exactly how long I want the curtains to be, plus I just love the way they look this way. Also keep in mind that you can trim the drop cloths to work for a smaller window. For example, if you’re trying to put these on a small window in your kitchen, you could just trim them to the size you need then fold over the cut edge with a bit of fabric glue to make a finished seam. For this look simply fold over the top half of the drop cloth until you’ve reached the desired length you want. I usually fold mine over at least 12 to 18 inches, but it’s your call based on how long you need the curtain to be and how much of the “ruffle” you want. Once you have the top folded over to the length you want, go ahead and start clipping the curtain to the drapery rings. I suggest doing the sides of the curtain first. I always start with one side, get it the height I want, then bring the other side over and match the length up so they’re nice and even even. Once that is done just start clipping the rest of the curtain in place, spacing the drapery clips even distances apart. It usually takes me a bit of adjusting here and there to get them just right. Boom. Two steps and you’re done. I wasn’t kidding guys–on the DIY difficulty scale these are a level one. That’s it! 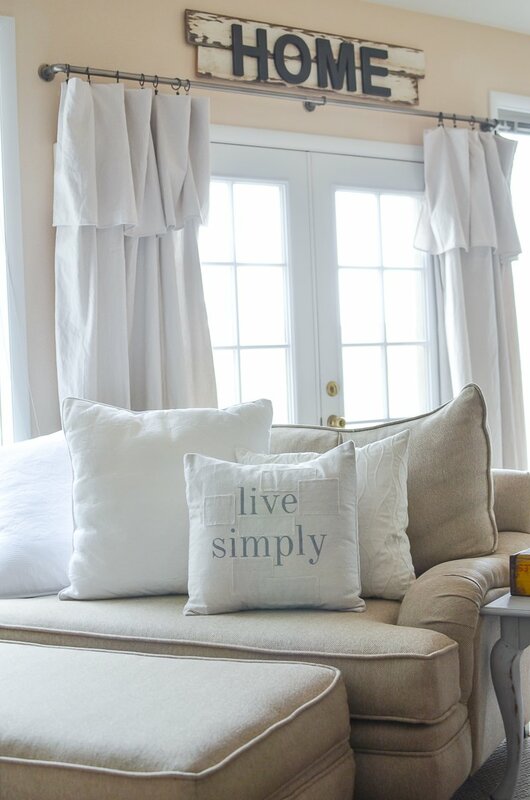 Drop cloth curtains are so simple. No sewing, no hassle. I love these so much and I will probably use them in our home forever. 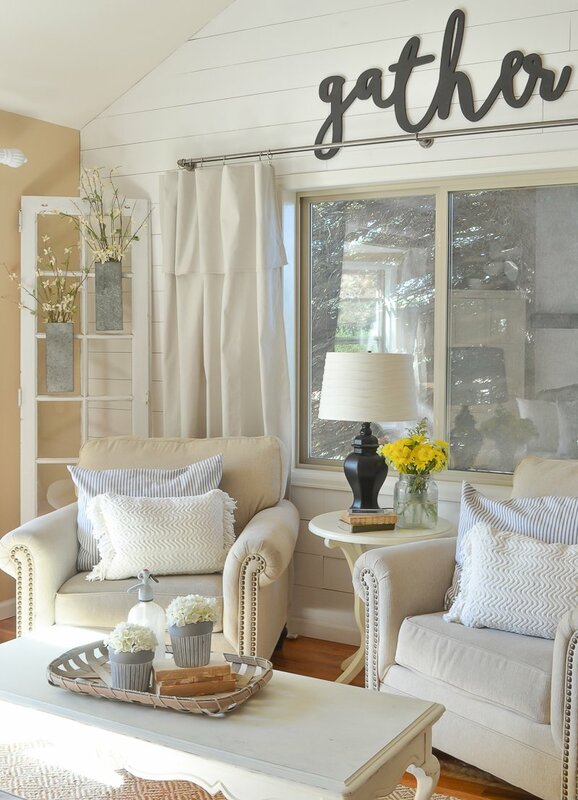 If you’ve never tried drop cloth curtains, I’d definitely suggest giving them a go. You just can’t go wrong at $11 a panel! And since they are canvas I actually think they’re a bit heavier than your typical curtain. They’re certainly not black-out curtains, but they still do a great job when it comes to keeping light out. They are AWESOME. Well I hope this step by step drop cloth curtain tutorial was helpful. Let me know if you have any questions at all! Ahh these are awesome!! I can’t wait to order some of these beautiful pillows. Question for you though I know your mom made yours but what size are they would you say 16 or 18 inch? The ones my mom made are like full size pillows, but I’d say go with the 18″. I always like my pillows on the big side! Love the look! What did you use for the curtain rod? Ready made or did you make them? You have made my life much simpler!! Oh yay!! So happy to hear that! Hope everything is going well with your family and sweet little one. Have you tried bleaching the drop cloths first? They turn out a little lighter and softer. Either way, they look great! Thank you for such clever ideas! Still my favorite blog! Hi Cindy! Things are going really well. My husband has some time off, so he’s been home with us ever since Ava was born and it’s been really nice. Sleep deprived, but good! 🙂 And to answer your question about the drop cloths, I haven’t tried bleaching them, but I might try to do that next time. I know you can also dye them different colors, which would be kind of fun too. Where did you get your curtain rods? Love the style. Oh my goodness! Oh my goodness! This is EXACTLY what I’ve been wanting! Thank you so much for sharing your creativeness! Love it! Yay!! I’m so glad it’s what you needed Kim! I made these for my bedroom and I absolutely love them! Great post!! I think I will cut mine in half, add a patterned material to the bottom, then trim the sides with a coordinating fringe. All of this done by using Stitch Witch, of course. I don’t know how to sew! 😯 Now I can make 2 panels out of one!! That’s such a great idea Crystal! I need to try that sometime. Absolutely live drop cloth curtains, going to make some for our living, dining and bedrooms!! Thank you for making it so easy!! Love it!!! I just bought the materials for mine!! Going to hang them up in my apartment at school when I move in! oh yay! I promise you’ll love them Alyssa. I just put mine up and I absolutely love them!! Thank you for the amazing idea! Thank you so much! I really love tjis blog and when I saw the curtain rods it was SO NICE to be able to click on the link you already had available!! Put them in my cart to picvk up already!!! That’s awesome Jordan, you will love that curtain rod! since they are canvas drop cloths, wondered if you can paint them? stencil? just a thought We are on the cusp of buying a fixer upper and this would be a fast fix! Yes! You can definitely play around with these to customize them. I know several who have actually dyed the drop cloths–so they possibilities are endless. I haven’t done anything like that yet, but I’m sure there are a ton of tutorials out there! I love it, I bought the drop cloth and only bought one, to make sure I loved it first! Now I will be going back to buy another! It’s in our guest room, now I’m looking at adding these to the master bedroom soon! I followed your instructions to hang these on a double window in my dining room this weekend. I LOVE them. Now I want them in the living room. Have you used these on any standard size windows? If so, did you cut them in half of use the full 6 feet on each side of the standard window? I have high ceilings in the living room, so I will definitely need the 9 feet of length. Thanks in advance. Yay that’s awesome Beth! I’ve used these on several standard sized windows and I didn’t cut them, just folded the top over a bit more. But you can always cut them if you needed to or hang your curtain rod a bit higher. 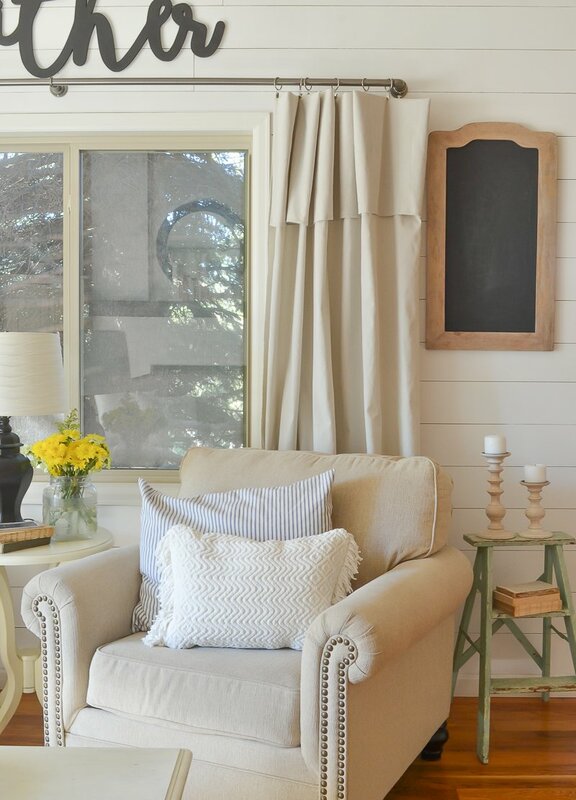 What is your shiplap paint color? Love the drop cloth Drapes! Question about the drapery clips… on amazon they are matte black.. yours look almost brushed nickel in photos.. are they black and its just the lighting? I have both black and brushed nickel! The brushed nickel clips are in our front room. I am so copy-catting your curtains!!! How far above and to the side did you hang your curtain rod? Thanks! I hung it about 6 inches above the window and about 4 inches or so out from the sides of the window. I’m planning to do a post very soon about that exact thing! I’ve had a few others tell me that too! I’m not sure if they changed the way they’re making them or what but it’s so frustrating. I’m sorry! Maybe the seam won’t be that noticeable when they’re ruffled together. Were the 1st canvases you bought the same length or did you have to buy a few before find matching lengths? Mine (from Lowe’s) were labeled 6 x 9 but crazy shapes. I had to buy a few to get matching lengths. And they had crazy seams going different directions that I also had to try to match. I’m wondering if Home Depot’s are perhaps better ones, or if this is a normal issue. I’d love to do them again but my 1st attempt was a nightmare…but I love them!! Hi so am a new fan! Love everything you post! and one of my favs is this curtains so I went to a Home Depot and bought the canvas you posted and mine come with a seem right in the middle of the canvas. 😩 is that a problem you had? Cannot WAIT to try these…..everywhere in the house!! I’m very afraid of pesky seams tho after reading so many comments here :(. I guess I will soon find out! Thnx so much. I think they’d probably work Candy! Just keep your receipt so you can return them if they don’t! Thank you so much for the detailed post on these curtains! They look great! I bought the same drop cloths today from Home Depot to do this. One question- do yours have a seam down the middle of the fabric? No seam on mine! But I keep hearing from several that have run into that issue. I don’t know if they changed them or what the deal is! Oh awesome Elizabeth! So glad you made them and love how they turned out!! 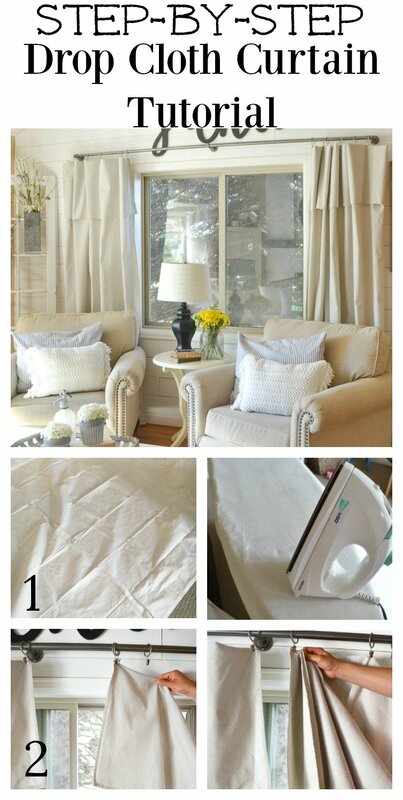 Your drop cloth curtains look so white in the picture, where do you find white drop cloths, the ones I find at Home Depot and Lowes are so off-white, even after I add four cups of bleach to the wash! I bought the same drop cloths today to do this. One question, they say “flammable” on the package. I am now wondering if it is a smart idea to use these on my walls near my fireplace…. What do you think? Thanks for step by step, love my living room drop cloth curtains. I found that my local (MD) Home Depot had two different Everbilt drop cloths. Ones made in Pakistan had seams, and ones made in India did NOT have seams. Check the package before buying! OMG I’m so glad you shared that Colleen!! I’ve had so many people tell me their drop cloths have seems and mine never have. Now I know why!! 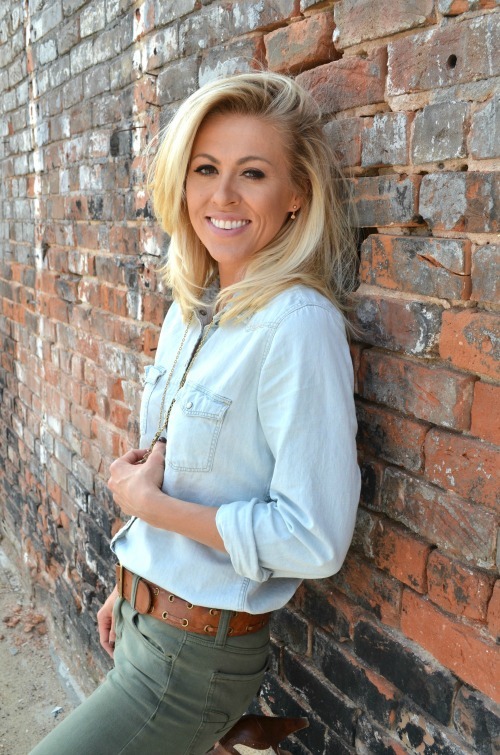 Hey Sarah, thanks so much for answering my question about where the curtains are from and directing me to this post of yours….silly question but are these curtains functional as well to slide over and cover the doors? Meaning do they provide enough coverage to cover French doors or sliding patio doors at night for privacy, or are they purely a decorated item and need to stay “open” and bunched at both ends? One more thing is I’m wanting to put these on sliding patio doors, so technically there are 3 glass panels on my door. Yours looks like a French with 2 doors? Have you ever used these on a 3-section space, or do you know if they would work/fit? YES they definitely do! That’s one of the reasons we love them. And they just as good at keeping out cool air as normal curtains do. We pull ours over all the time at night for privacy. Cant wait to make the drop clothe curtains. I can’t wait to do this in my house! For another cost saver, you can buy the drapery clips from Amazon, much cheaper than Walmart or other vendors. I bought a pack of 40 clips for $12.00. May help others!